This dessert was created using the above four quotes as inspiration. The first two are from a scene at Marian's workplace, Seymor Surveys, where she edits market research questionaires. The first quote is the dietitian's response to Marian's suggestion of adding raisins to the canned rice pudding she's been asked to taste test. Canned rice pudding appears several times in the book symbolising the ultimate convenience food for busy housewives, hence why I decided the 'gooey middle layer' had to be rice pudding ice cream. I'm guessing nowadays, any dessert containing rice pudding is far more risky than one made with raisins. The last two quotes are from the title scene of the book where Marian bakes and presents her fiancee, Peter, with an edible woman as a test of his unconscious desire to consume her (hence the woman-shaped cookie cutter). I found the cookies held their shape better if the cookie cutter was pressed into the whole rectangle of rolled dough on the tray before baking and separated afterwards by pressing the cookie cutter back into the outline and tracing around the edge with a knife if neccesary. Stir rice pudding, vanilla and cream together. In a separate bowl, whip egg whites and sugar until stiff peaks form then add to the rice mixture and fold until well combined. Pour into a large-ish freezer safe plastic container, seal the lid and place in the freezer. Stir with an electric mixer every half hour for 2 - 3 hours to break up the ice crystals (depending on the shape of your container you may need to run a knife around the edge and into the corners). This is the fun bit! It's also self explanitory, but I'll tell you how I did it anyway... I froze my ice cream in a rectangular container then turned it out onto a cutting board by cutting around the edge with a butter knife and diping the bottom of the container briefly in warm water. Then I used my cookie cutter and a knife to cut perfect lady-shaped centers for my lady-shaped biscuits. Sandwich together and leave to soften slighty before eating. "I'd been speculating for some time about symbolic cannibalism. Wedding cakes with sugar brides and grooms were at that time of particular interest to me." [...] "It's noteworthy that my heroine's choices remain much the same at the end of the book as they are at the begining: a career going nowhere, or mariage as an exit from it." "Raisins are too risky ... Many don't like them" (p.18). In part two of The Edible Woman the narration switches from first person to third person as Marian becomes a passive observer rather than an active participant in her life. She drifts apathetically from one situation to another and acquiesces to all kinds of demands (from her body, her fiancee, her friends and from Duncan) as though each were inevitable and unavoidable. I've been trying to come up with an idea for a cake that embodies Marian's disturbed state of mind. Something that says 'identity crisis' or 'deconstruction of the self'. When I saw the Cookie Cake Pie over at cakespy I thought I was onto a winner but decided against it on the grounds that (aside from being one big mash-up of a dessert) there was no significant symbolism between it and the book. I've also looked at numerous ways of deconstructing a banoffee pie (because some might say Marian is 'going bananas') but have shelved that idea as well. I'm now thinking along the lines of a tasty fake. The most frequently mentioned foods include: eggs, raisins, canned rice pudding, and spaghetti with meat balls. Wish me luck! "Are you going to have them serve it hot?" I asked, "Or maybe with cream?" Consumerism isn't just an overarching theme in this novel, it's an all smothering one: Posters of girdle-clad young women, sly tactics used by supermarkets and advertisers to entice weary housewives, and the question of whether women become commodities when 'given away' in marriage. 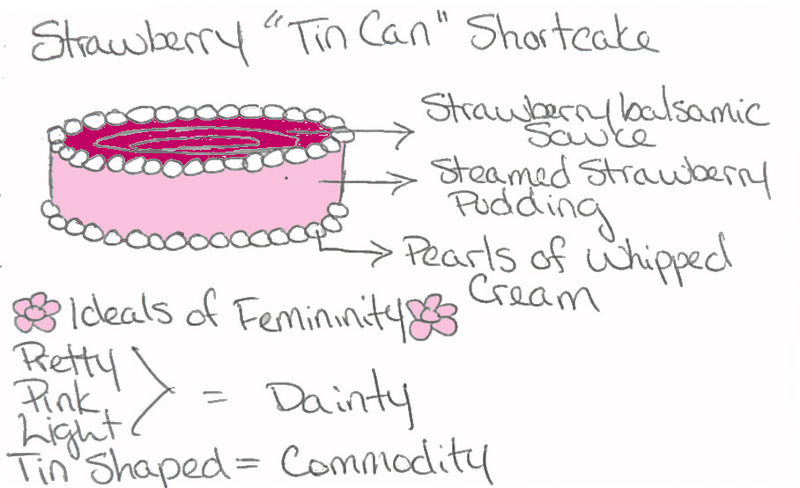 I wanted a dessert that reflected 60s femininity as a commodity. Something that could be packaged and sold to those same weary housewives as a worthy substitute for the real thing. And, of course, it had to be pink. 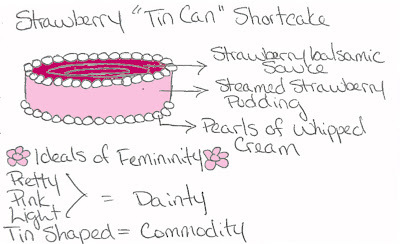 2 tins (Net Weight aprox. 400g or 14oz) strawberries in juice, drained. Reserve liquid. Start with the sauce. Place reserved strawberry juice and sugar in a saucepan and reduce to 125ml (1/2c). Set to one side and allow to cool. Pre-heat oven to 150*C (300*F). Carefully grease & flour 6 well-scrubbed tuna tins (or ramekins). Cream butter and sugar until light and fluffy. Add egg yolks one at a time blending well after each. Add flour in three parts. (I found this made a very stiff batter. You may want to loosen it with 1-2tbsp water). Add strawberries and stir with a spoon until you have a smooth batter. In a second bowl, whip egg whites until stiff peaks form and fold gently into strawberry batter. Place your prepared tins onto a roasting tray and fill each one 3/4 full with batter before topping up with what remains. Cover with tin foil and secure with string or rubber bands. Fold excess foil up out of the way so the ends don't get wet and pour boiling water into the roasting pan so it comes 1/3 of the way up the sides of the tins. Place on middle rack of the oven for 25min or until a knife inserted in the centre comes out clean. Immediately remove foil, run a knife around the edge of the tins and tip onto plates (they should release by themselves if left 30sec or so). Mix arrowroot powder with a little cooled juice before tipping it into the saucepan. Gently heat - do not allow to boil - stirring constantly until mixture thickens. Take off the heat and stir in the vinegar. Pipe sweetened whipped cream around slightly cooled puddings before spooning sauce over the top.Garnish with extra strawberries if desired. Just found these 60s Jello-O dessert photos on oh so loveley vintage. Loving that retro food styling! I'm going to have a lot of fun with this one.